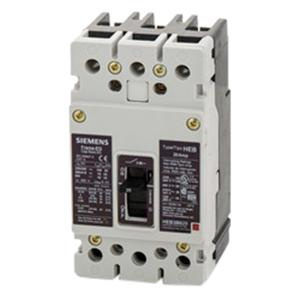 Siemens Type HEB 3-Pole molded case circuit breaker is rated at 15-Amps and 600/347-Volt AC. Interrupt current rating of this circuit breaker is 25-Kilo-Amps. It measures 3-Inch x 3-Inch x 5.5-Inch. This 3-Phase circuit breaker with load lugs connection, accommodates wires of size 14 - 1/0-AWG. This EG-frame circuit breaker features LI and fixed thermal-magnetic trip function to ensure reliability. This HACR rated circuit breaker supports bolt-on mounting. It withstands temperature of 40 deg C. It comes with load lugs. Molded case circuit breaker is UL listed and CSA certified. * Inventory displayed is accurate as of 04/19/2019 10:40 EDT.